A tall gentleman walked into Little Next Door on a Tuesday night with sunglasses and a chic scarf tied around his neck. At first I thought he was the talented actor Liam Neeson with long hair. When he took off his sunglasses, I realized this very handsome French man with an air about him was Nicolas Meschin, one of the owners of The Little Door and Little Next Door. He sat next to me throughout my dinner with a group of foodies and shared some interesting facts about the rise of The Little Door and what new at Little Next Door. In his 20’s Meschin followed his brother Frederic to Los Angeles and worked along 3rd Street in a Paris/Mexico Cafe. “We made French dishes and rolled them into a tortilla for a burrito,” Meschin said. He started as a dishwasher and did a little bit of everything in the restaurant. “We used to share a cooler with Nobuyuki “Nobu” Matsuhisa at the Japanese restaurant Oshou in the late 1970s,” Meschin said. Nobu worked next door to Meschin until Nobu opened his own restaurant Matsuhisa on La Cienega Boulevard in the late 80s. The Meschin brothers opened their nightclub/restaurant, Flaming Colossus in the late 80s in downtown LA. “It was the Studio 54 of Los Angeles and a very artistic community back them,” Meschin said. He told me how the rock group U2 and Bono used hung out often, as did the new and innovative cast from Cirque de Soleil after they performed in their first So Cal show in Little Tokyo. The brothers made a strong connection with Cirque de Soleil and soon started catering all of their Opening Night and VIP dinners. Today, they continue to work with the company whenever they are in town. 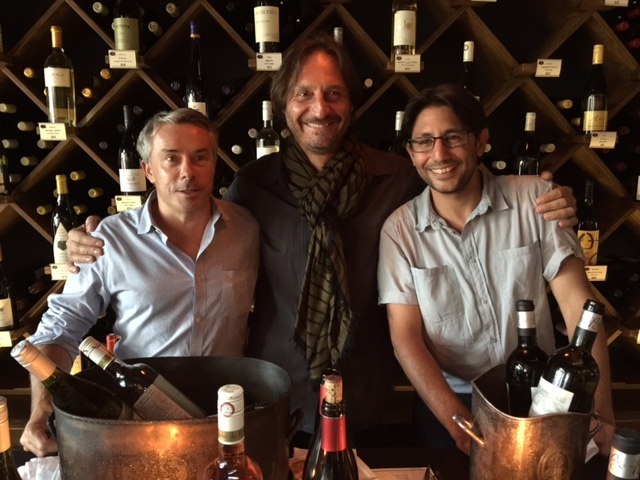 When the brothers discovered a space became available for The Little Door, they envisioned a new dining experience for Los Angeleos by opening the city’s first wine bar serving authentic French-Mediterranean cuisine. The restaurant featured a variety of over 70 bottles of wine by the glass. “At the time there were 300 vineyards in California, now there are over 3000,” Meschin said. They took the wine wave at the right time and acquired bottles of wine at more reasonable prices. Currently they have a spectacular wine collection with one-third from California, one-third from France and the remaining is a diverse collection from all over the world. In 2006, with their success, they opened Little Next Door (literally next door) offering a true homemade croissant and lighter fare that included salads, sandwiches, salads, freshly baked organic breads, pastries, egg dishes and a variety of our famous house-made jams and preserves. While chatting with Meschin, I learned he recently opened another The Little Door in Santa Monica. 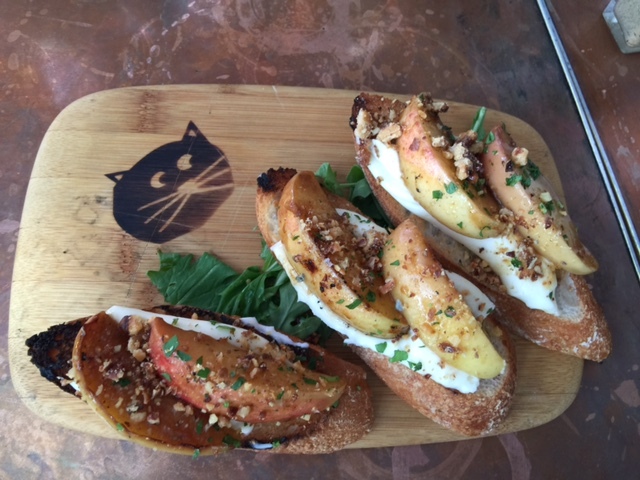 While biting into a thick crusty crouton lathered with brie and mascarpone cheese layered with slightly sweet glazed apples and sprinkled with microgreens and candied walnuts, he shared he also is working on a The Little Door up in Santa Barbara. 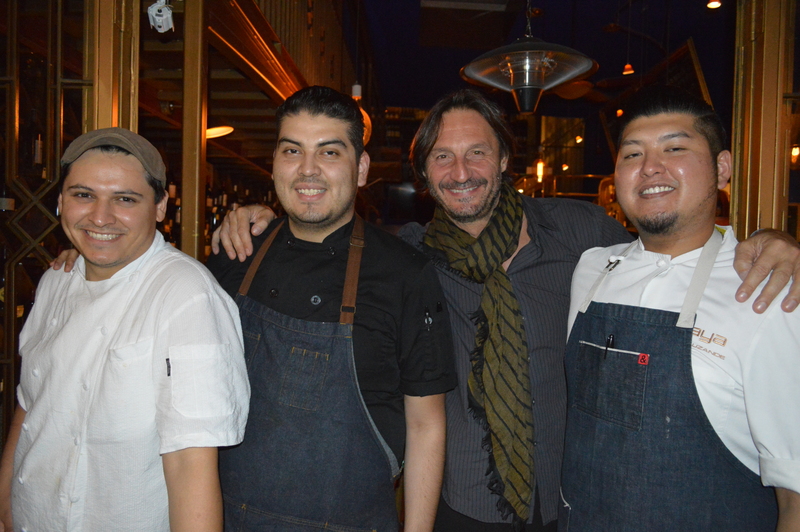 The new chef Kevin Luzande at Little Next Door recently took over the kitchen after leaving Acabar in Los Angeles. He has worked in the kitchens of the Ritz Carlton in Marina Del Rey, and at Rivera and Playa. His specialties on this menu include a tuna tartare with a Japanese/Latin flair that included red pepper paste, avocado, scallions, shoyu and blue corn strips to scoop the soft ingredients and offer a crunchy texture. The beet salad offered a variety of colored chopped beets with a pistachio granola next to creamy goat cheese and arugula. Luzande creates spicy large prawns bathed in heat with Harissa and Aleppo peppers then cooled with labneh and pistachios. The wine stewards of the evening – Francois and Didier poured glasses of French Rose’ and a slightly sweet white Francios Lurton “Les Fumees Blanches. Both paired nicely with the spiciness of the tuna tartare and prawns, offering the smell of citrus fruits with tropical notes and a hint of smoke. For our next course, we all raved about the creaminess of the cauliflower dish. The roasted and caramelized cauliflower sat on a bed of luscious cauliflower puree. It was a satisfying vegetarian dish, as was the corn pudding summer ravioli served with chanterelle mushrooms and chive blossoms. Luzande takes fresh sweet corn and reduces it to a thick liquid slowly for one hour before it caramelizes the sugars. His pillowy ravioli pasta is stuffed with the corn and lightly drizzled with butter nage. It just melted in my mouth. Another dish that sent a pleasing shiver throughout my senses was the salmon risotto made with a zucchini and basil puree. This healthy dish had a generous piece of salmon cooked perfectly with baby squash, oven dried tomatoes and fresh parmesan. Francois recommended a white Chateau Goudichaud, Graves De Vayres from Bordeaux to accompany this dish. Even though I had enjoyed more food than I normally would eat in one sitting, I had to pierce my fork into two strips of Sterling Silver top sirloin served with a green peppercorn reduction. It was paired with a glass of Ramon Bilbao Tempranillo from Crianza. The cherry-red color wine offered an intense aroma of ripe red berries, bay leaf and mineral touches and some cocoa. 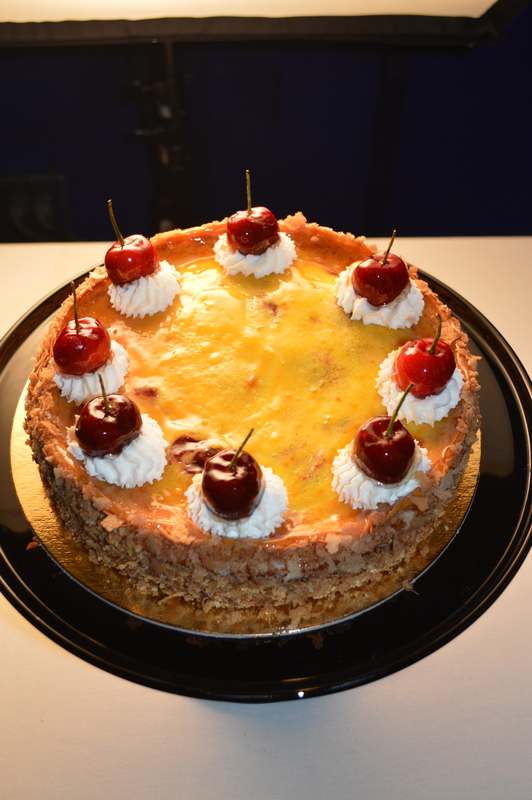 Known for their abundance of French pastries, macarons, cakes, tarts and pies, I was very pleased when a beautiful whole cherry chafoutis arrived to our table. Next, a plate of lovely lemon tarts was sent to our table topped with pristine white meringue and brown highlights. Cake plates were delivered with warm chocolate, coconut and pistachio macarons. Most restaurants and pastry shops serve macarons cold that are hard to the bite, these macarons were warm and heavenly. The pièce de résistance was small chocolate and caramel pot de creme with a sprinkling of sea salt and fig slices on top. The desserts covered all bases to satisfy everyone’s sweet tooth. Come find the soul of French cuisine at Little Next Door. Lunch is served at 11 a.m. to 4 p.m. Dinner is nightly from 6 to 11 p.m. They also have Happy Nights Monday through Friday from 4 to 7 p.m. On weekends brunch is served on Saturday and Sunday from 9 a.m. to 4 p.m. $$ 8142 W. 3rd St. (323)951-1010.